The founders and executive team of Dominion Construction Services bring a legacy of expert construction capabilities, which spans over 100 years and three generations. Dominion Construction Services has built over 35,000 homes and millions of square feet in commercial development across America. The team has completed award-winning projects in the private sectoras well as for the Federal Government, including the Los Alamos National Laboratory, Department of Energy, Department of Defense, Veterans Administration, FEMA and HUD. Headquartered in Bingham Farms, Michigan, Dominion Construction Services offers a full range of professional Construction Management and General Contracting services to clients and partners across a broad scope of industries, including: automotive, industrial, retail, office, R & D, urban and suburban mixed-use, manufacturing, government, civil infrastructure, residential and multi-family sectors. Dominion Construction Services is recognized as a creative and cost effective solutions provider for complex construction challenges, as well as an expert in land development. Design-Build, Build-to-Suit and Bid-Build projects are all approached and executed with a systematic process, utmost attention to detail and clear and consistent communication throughout, resulting in on-time, on-budget delivery. 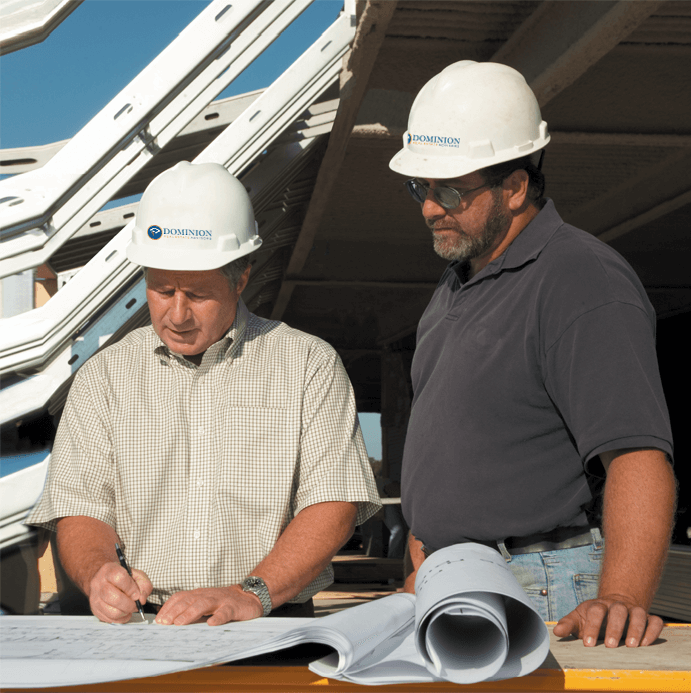 Benefitting from an understanding of all aspects of real estate, acquired through its long history and the synergy that is created within a full-service real estate enterprise, Dominion Construction Services brings a unique, “Big Picture” understanding to each assignment. This broad perspective results in thoughtful and intelligent construction solutions, creation and protection of long term asset value, as well as award-winning and efficient design to support on-going, cost effective property management. Dominion Construction Services is dedicated to bringing our client’s vision and objectives into reality. Dominion Construction Services performs with quality, passion, integrity and a team approach which incorporates trusted industry professionals with a historical track record of outstanding performance and proven cost effective solutions, even in the most challenging conditions. Dominion Construction Services continues the legacy of success and customer satisfaction by employing high quality professionals in estimating, value engineering, procurement, supervision and contract administration. Consistent training and education in the latest construction techniques, as well as technology-driven scheduling and project management tools, further enhance the exceptional and tangible benefits to our clients and partners. We would be happy to discuss how our team at Dominion Construction Services can help you accomplish your construction goals.